It’s like something out of a horror movie. A US teenage recently woke up with severe earache. The cause - a 10 cm centipede wriggling inside his ear. Grant Botti managed to grab hold of the centipede and pull it out before it could move deeper and cause serious harm. It’s like something out of a horror movie. A US teenage recently woke up with severe earache. The cause? A 10 cm centipede wriggling inside his ear. Grant Botti managed to grab hold of the critter and pull it out before it could move deeper and cause serious harm. 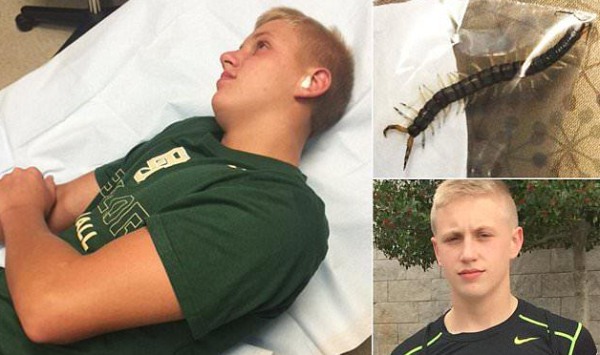 Botti’s mother put the live centipede in a plastic bag and rushed the brave teen to hospital. Doctors found that the many-legged critter had caused small abrasions on Botti’s eardrum. They added that they’ve never seen a case like this before. Where the centipede came from, no-one knows, but the Arkansas teen said that he had been swimming outside recently.